Another video from the JIM CLEMENS COLLECTION covering the steam scene around Shropshire. Beginning at Birmingham Snow Hill we travel via Wolverhampton and Oxley to Wellington Salop. Both routes into the town from Stafford and Crewe at all stations for most were in Shropshire. Shrewsbury in fine detail, Jubilee, Manor and Standard types. Leaton bank action in 1966, Gobowen to Oswestry. Whitchurch to Oswestry and Ellesmere to Wrexham. South of Oswestry to Llanymynech and Llanfylin. Nantmawr quarry to Gobowen with a steam hauled ballast train. 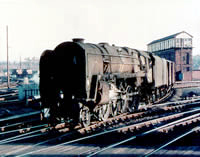 Plenty of steam at Oswestry including the sight of a Castle on the shed in 1963. And we see the Shropshire & Montgomery on closure day in 1960 with the SLS tour. Absolute nostalgia.